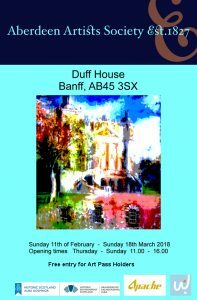 Aberdeen Artists Society (AAS) and Historic Environmental Scotland are hosting an open exhibition at Duff House in Banff. With Aberdeen Art Gallery closed for refurbishment, the AAS has had to look further afield to show their work. Duff House is a prestigious location, home to many significant works of art from the National Galleries of Scotland’s collection. The sponsors of the exhibition, Apache and Wallacespace, awarded £5500 worth of prizes; following the deliberations of two independent judges half of the awards were presented to artists under the age of thirty-one. Forty-two artists were selected by the AAS to show their work, using a wide range of media: painting, printmaking, performance, sculpture, photography, textiles, silverware and ceramics. Council members of AAS curated the exhibition, with exhibits in the Long Gallery and the North and South Exhibition Galleries. In the North Exhibition Gallery there are three pieces by the sculptor Helen Denerley, Mountain Goat, Mountain Goat Kid and Rock Ape. A mother goat on a plinth looks down at her kid; the expression in her eyes is tender, maternal love reaching out to her offspring. It is deeply moving, and this is no mean feat for a sculptor who fashions her work from old bicycle parts and pieces of scrap metal. 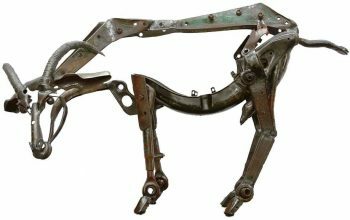 Denerley refers to the gaps between the pieces of metal as “positive space”, rather than “negative space”, a space where our imagination can roam and visualise the animals in the flesh. Three pieces by Robert Mach have been playfully fashioned from the flattened foil wrappers of Tunnock’s teacakes. Blue Buddha, a 3D mixed media piece depicting the head of the Buddha is covered in the familiar silver and blue stripes of dark chocolate teacakes. Skilful positioning of the stripes over the Buddha’s face has imbued the work with a sense of divine serenity. Queen Grimhilda is a portrait of Margaret Thatcher in an elaborate baroque-style frame. Her face has been made from tiny cut out pieces of foil; the “positive space” creates a bold 3D image and a striking likeness. The joke lies in the use of milk chocolate teacake wrappers, which are red, not blue. Bonzo Dad partners Queen Grimhilda, an equally well-executed portrait of Ronald Reagan made from silver and blue wrappers. 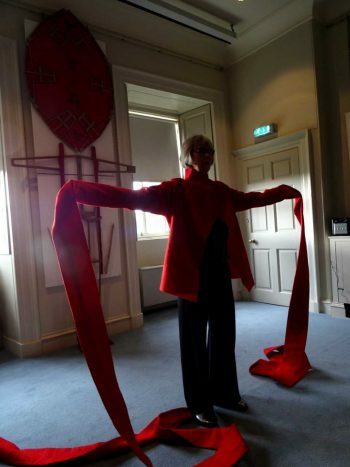 Shelagh Brown’s work, Coat of Arms (Up in Arms), is a feminist interpretation of a coat of arms as a protective shield. Her work combines performance, spoken word, 3D artwork and a striking red felt jacket with arms that are several metres long. Her work explores times when it is acceptable to be “up in arms” about life, and times when we need to open our arms wide to embrace others and the world around us. Open exhibitions like this make an important contribution to Scotland’s cultural infrastructure. They give younger artists an opportunity to gain confidence and experience by exhibiting alongside international and acclaimed artists. 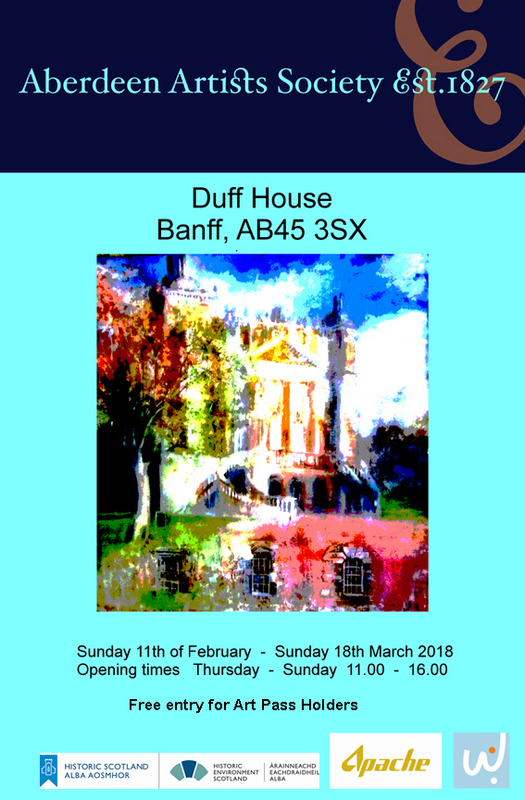 It’s worth noting that Duff House actively seeks proposals for new exhibitions from individuals and groups of artists. Anyone who is interested should, in the first instance contact its General Manager for further details. Likewise, it is worth keeping an eye on the AAS on social media for future open selected exhibitions. Climbing the steep staircase at Duff House, with its rectangular landings and bold arches, is reminiscent of Escher’s gravity-defying staircases in his famous lithograph Relativity. It’s a dizzying climb, with interesting twists and turns and unexpected vistas. The AAS have used the stairwell to brilliant effect to display Flight Patterns, a stunning sculpture by April Pressley. I’ll say no more – I don’t want to spoil April Pressley’s surprise! Go north to Duff House; see the whole exhibition for yourself and you won’t be disappointed.